Buyers of help desk and customer support software face many challenges when evaluating new systems. While diverse and varied from company to company, most of these challenges grew out of a handful of market trends that began in the 1990s and continue today. This report outlines the development of those trends to provide a clear perspective that small and midsize businesses (SMBs) can use to address the challenges they face in seeking help desk and customer service software. 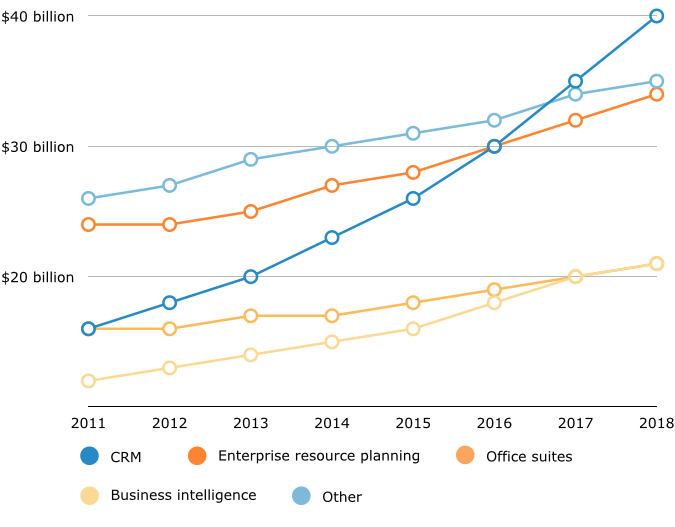 The market for CRM software, including help desk and customer support platforms, grew nearly 2,000 percent in the 10 years leading up to 2007 and continues to grow today. Ticketing is the core application of help desk support platforms today, providing the organizational structure that primary support services and applications are based upon. Self-service support channels have grown in popularity: they are now preferred by many customers, and help businesses save money by replacing more costly channels, such as phone support. 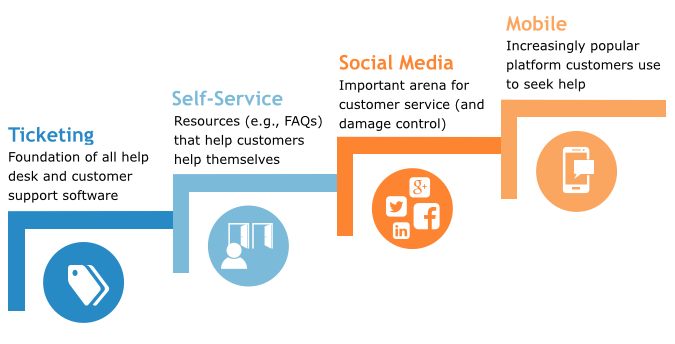 Many help desk platforms now include integrated social media apps to manage the positive and negative impact that customers can have on a company’s reputation through social media posts. As more consumers use their mobile phones to seek customer service online, more companies use mobile-friendly customer service software to ensure customers can find the help they need. Customer relationship management (CRM) is a broad software category that includes marketing, sales and customer service applications. 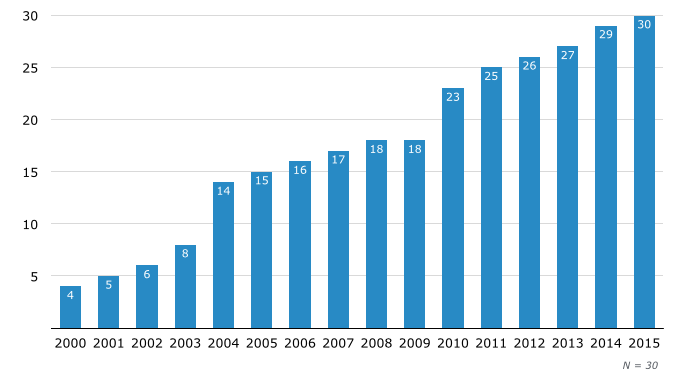 Fueled by several factors, the CRM market has seen explosive growth in the past 15 to 20 years. From a “big picture” perspective, the primary force behind this growth is the proliferation of digital and online communications, in all their various forms. To better illustrate what changes these communication types have brought to help desk and customer service software, we’ve identified four major market developments. These four developments occurred in roughly the order depicted below, with each new generation of software adding to and integrating the preceding stage(s). Together, these developments have fundamentally changed the nature of the way customers and companies interact. These four developments aren’t merely part of help desk software’s history—they represent central aspects of many help desk and support platforms today. In this report, we illustrate how historical trends have shaped these developments, and provide software buyers with the perspective needed to make informed purchasing decisions in a rapidly expanding market. Starting in the mid-1990s, the market for CRM software began to rapidly expand. In fact, from 1997 to 2007, annual sales of CRM software grew from $762 million to $14 billion; an increase of nearly 2,000 percent. This growth is only expected to continue. Some experts suggest that in the near future—perhaps as early as 2017—annual CRM sales will surpass sales in all other software categories. As annual sales have increased, so has the number of CRM products on the market—not to mention the variety of products and types of businesses they are sold to. While CRM software was designed primarily for large-scale enterprises in the 1990s, by the early 2000s, more vendors began targeting SMBs. We began by making a list of the 50 most well known and widely used help desk products available in 2015. From this list, we removed 20 products that either clearly target enterprises, or have little to offer to SMBs. Using Archive.org’s website archive, we then looked at the historical websites for the vendors of the remaining 30 software products. From these website archives, we determined which portion of our 30-company sample had created websites and when, what products they sold and what functionality they highlighted at different points in time. The growth of the overall CRM market, as well as the number of CRM products targeting SMBs, illustrates one of the challenges help desk software buyers face: how to choose the right solution among so many viable options. With more features, applications, deployment models and pricing structures on the market today than ever before, buyers have a complex matrix of variables to consider when shopping. Four of the most important variables are represented by the four market developments listed above. Next, we’ll explore each one in detail to help buyers understand more about how each functions and how they can improve customer service and support operations. Today, most organizations claim to have a “customer first” approach to service. However, when looking into the origins of ticket management—the central application of help desk software—its development and adoption were initially driven by the need to address internal business challenges. Thus, the formative phase of help desk software was guided by decidedly “company first” motivations. Alan Berkson, now director of community outreach for Freshdesk, a leading provider of customer service and support software, shares some insight on these early years. Berkson’s customer service career spans several decades, going back to the 1990s, when he managed customer support for an IT services provider. Record keeping might seem, at first, like an obvious need—but at that point in time, ticket creation “was still a manual process, disconnected from actual work,” Berkson continues. When an employee received a call with a support request, they’d get to work resolving it. Creating a detailed record of the request, including each step taken to address it, was simply not part of their regular routine. Thus, one of companies’ main motivations for implementing help desk and support software systems was the need to add structure to previously unstructured workflow processes. The challenge was adding this structure without also adding responsibilities that could lower worker productivity. However, the use of digital communications, such as email, was also becoming more popular at this time—and therein was a solution. As the number of service requests arriving via email increased, help desk software vendors introduced applications that could automatically create and update tickets from emails. Support employees could continue to do their jobs as before, without needing to stop and create or manage tickets every step of the way. Ticketing functionality soon became the universal infrastructure of customer service and help desk software systems—and still is today. Automatic ticket creation: Support tickets can automatically be created from emails that meet certain criteria (e.g., that contain specific words), streamlining operations for support agents. Multichannel ticket creation: Users can enable ticket creation on the channel a customer uses to make contact (e.g., chat, email or phone) and unify tickets from various channels into one system. Automated ticket routing: The software reviews newly created tickets and assigns them to the right department or agent, based on the details of each individual ticket (e.g., the complexity of the support request). As email paved the way for automated ticket management, another digital communication tool led to the next step in the evolution of help desk and customer support software. That tool is the Internet, and the development it made possible is one of the shining stars of customer support today: online self-service. Self-service can be traced back to at least the early 1990s, when companies first began launching their own Web pages. Back then, self-service existed in the form of FAQ pages, which offered answers to customers’ most common questions. Today, FAQ pages are just one of many self-service components. Self-service also includes searchable knowledge bases and “virtual agent” software, which helps customers find the specific information they need by answering a series of questions. According to a survey by CRM vendor Zendesk, self-service is preferred by a large majority of consumers today, and 67 percent that prefer it over speaking on the phone. What’s more, a recent Software Advice survey shows that companies find it to be an extremely effective service strategy: Self-service deflects questions from more expensive channels, while helping customers quickly and easily help themselves. 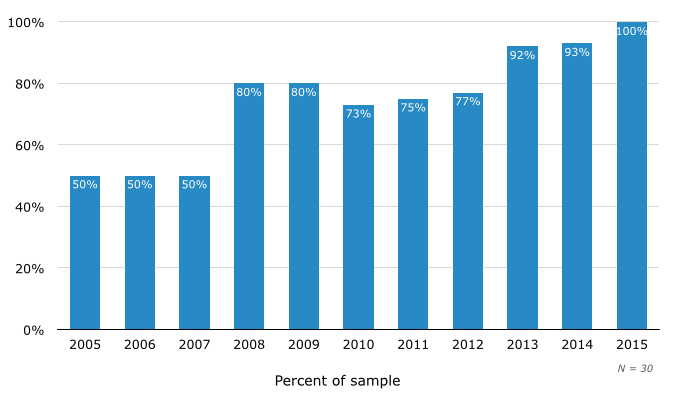 Though tools to manage and provide self-service weren’t commonly integrated in help desk software until until around 2009-2010, they’ve since become very common, as shown in the following chart. Self-service channels are a great example of finding that balance. They offer a win-win solution: giving customers the answers they need in the format they prefer, and saving companies money by deflecting phone calls away from expensive call-center agents. Knowledge management systems: These allow users to select and refine some of the information resources (e.g., “how-to” articles) used by their customer service employees, and make them available to customers. Ticket deflection and suggestion tools: These can automatically direct customers to articles or FAQs that address the topics of the tickets they submit. Self-service resource usage monitoring tools: These show which online articles are most helpful and used most often, allowing companies to spot issues that requires more and/or better resources. Of all the changes that have come out of the rise of digital and online communications, social media may be the largest disruptor of customer service strategy. With sites such as Facebook, Twitter, YouTube and Yelp, customers can air their praises and complaints in public, influence the opinions of friends and family and affect the bottom lines of any business they patronize. When consumers first started using social media as a way to publicize both their good and bad experiences, companies were caught off-guard—particularly by the reports of bad experiences. They lost some control over their brand messaging, and their struggle to regain control continues to this day. “One big challenge companies face is the very high speed of social media,” Greene-Pierson says. A bad review of a restaurant posted this morning, for example, can affect that business’s sales by lunch. While social media presents one of the biggest challenges to companies’ support strategies, it’s a challenge that can be addressed very effectively with the right customer support platform. Around 2009-2010, help desk and support software vendors began adding a variety of social media tools. Today, most major software vendors offer integrated tools to address these challenges. Greene-Pierson points out that sales, marketing and customer support departments can work together to manage social media support contacts. “Finding tools that help [departments] share the load is what’s important. For example, if a marketing person can create a support ticket from a tweet they’ve seen, then that helps both [the marketing and support] departments—and helps the company as a whole,” she says. Many companies are even creating new roles, such as “customer experience manager,” to better bridge the gaps between departments and ensure customers have uniformly positive interactions. For example, if customers have trouble receiving support on a social media page because it is managed by the marketing department instead of the service department, a customer experience manager would be tasked with finding a solution. Freshdesk’s Berkson emphasizes that social media shouldn’t be viewed simply as a problem that needs to be fixed. It can also serve as a source of valuable information for companies—so long as they have the tools in place to learn from it. While this approach has been largely embraced at the enterprise level, Berkson says, it’s much less common among SMBs. Listening tools: These alert businesses to specific mentions of their brand or products made by customers on Facebook, Twitter and other online social communities. Sentiment monitoring tools: These analyze the wording used in social mentions, alerting users to long-term changes in customer satisfaction or short-term spikes that need immediate attention. Social media ticketing tools: These allow users to create new tickets from complaints raised on social media, ensuring they get the same attention as tickets created through more traditional channels. One of the golden rules of customer service is to make it easy on the customer: The fewer hoops they need to jump through, the better their chances are of emerging on the other side still smiling. Channel switching—changing back and forth between communicating via email, phone, chat and social media—is one big hoop that may discourage customers. If they contact support via one channel, they generally prefer to have the problem resolved on that channel, without switching to another. In addition, more consumers are now using mobile phones for an increasingly wide variety of tasks, including researching and purchasing goods and services. As such, companies providing those goods and services must ensure they also provide support via mobile. “Access to support has to be provided on the devices people are actually using, and it needs to be flexible enough that anybody can access it from anywhere,” Greene-Pierson says. Berkson notes that mobile is especially important for international companies. “Remember that while in the U.S., consumers have a variety of digital devices, in much of the rest of the world and nearly all of the developing world, consumers often have only one digital device: a mobile phone,” he says. So, how do companies provide better support via mobile devices? The first step is to ensure their websites and online resources are mobile-compatible. This can be done using “responsive” website design, which adapts the layout of a Web page to the size of the screen the visitor is using. Mobile-friendly live chat platforms: These enable companies to add live chat functionality to their websites, while ensuring such platforms are accessible and user-friendly from a mobile device. Click-to-call/click-to-chat: This allows customers who are viewing support pages (e.g., FAQs) on mobile devices to simply click a button to call the company’s service number or start a live chat. Self-service integration: Existing self-service resources, such as FAQs and knowledge bases, can be integrated with a mobile app, letting customers find answers without switching channels. As we’ve seen, the market for CRM software is rapidly growing, and is expected to soon be the largest software market as measured by annual sales. But with this size comes complexity, variety and choice—all of which present challenges for CRM software buyers, especially SMB buyers who often have limited time and resources for software selection. At the same time, the relationships at the heart of CRM have been dramatically altered by the proliferation of online and digital technology. The advent of email, websites, online self-service, social media and mobile technology has exponentially increased the variety of ways companies and their customers communicate with one another. This, too, presents a variety of challenges to CRM, help desk and customer service software buyers. Together, these two trends can create uncertainty, as today’s CRM software buyers often feel the need to aim for multiple moving targets. But while the changes listed above can make software selection more challenging, they also present new opportunities. By understanding these changes, and considering them when choosing software, SMBs can seize these opportunities to improve the service they offer and grow their businesses. To collect the historical data in this report, we compiled a list of 50 help desk software vendors. To be included in this list, the vendor must have had an active website and product as of March 2015; had a product best described as “help desk,” “customer service” or “service desk” software; and had some degree of name recognition. Twenty vendors were removed from this list because their products focused on enterprise-class companies. 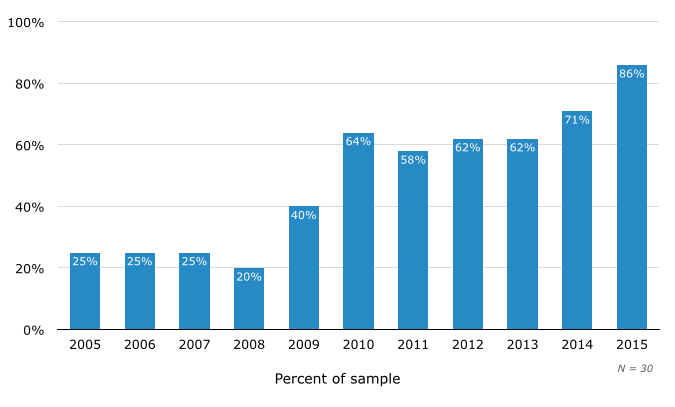 We then surveyed the websites of the remaining 30 vendors, examining them at yearly intervals from 2000 through 2015 using Archive.org’s website archive. 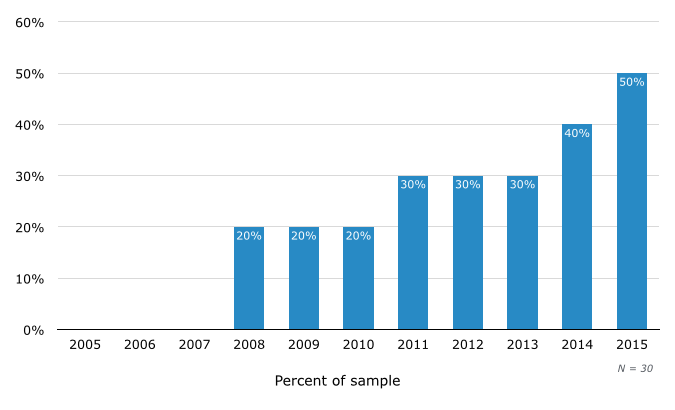 From these archives, we determined which portion of the 30-company sample had established websites at certain points in time, what applications they sold and what specific functionality they offered at certain points in time.